Smuggler’s Offers is one of the many Random Encounters in the Evolution: Battle for Utopia game. Can be accessed through button above missions. Sells various weapons, resources or ammo for gems. May also have a mini games. There can be only one offer of the type at the same period of time (but few different types). Each offer is appears from the certain player’s level. After expiration, the offers are randomly repeated every 1-3 weeks. After buying the offer, the following action of the same type will appear not earlier than in 1-3 days. Each deal has a funny description of Rebecca. Every offer has a lower and an upper limit of appearance, depending on Player’s Level. 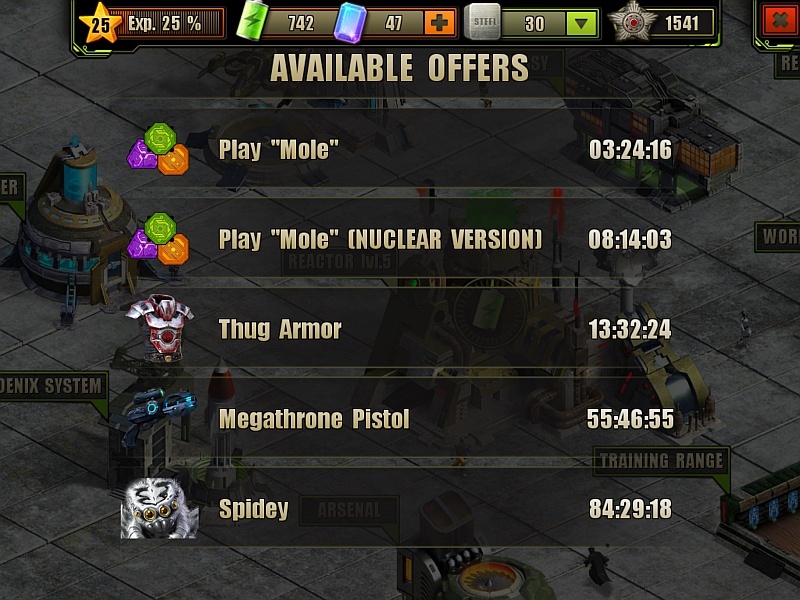 When do you unlock Mole nuclear version? I only get the normal version and I’m level 23. Je me demandais si c’était normal ? If you’re past an offer’s upper level limit and never gotten the offer before, can you still get it? I read somewhere in the wiki that the offer can re-appear every 1-3 Weeks after you refuse it. it will reappear unless you go over the offer’s level limit.